Not surprisingly, the Horizon League did not feature a semblance of a conference race last season. 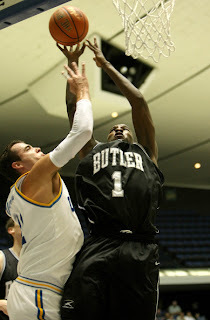 Butler ran through the conference undefeated, with 12 of the 18 Horizon wins coming by double-figures. There was quite a battle for second place, as Wright State shrugged off a 4-4 start to win eight of its final 10 league games and get a double-bye. Four other teams finished above .500 in the league, with a talented Detroit team going 9-9. Butler left no doubt in the conference tournament, destroying Wright State by 25 in the title game. We all know what happened in the NCAA Tournament: the Bulldogs made a run all the way to the championship game before losing to Duke when Gordon Hayward’s half-court heave at the buzzer rimmed out. Expect much of the same in the Horizon this season. 1. Butler: There won’t be much of a race in the conference this season, either. Shelvin Mack and Ronald Nored are a great guard tandem, and Matt Howard bangs down low. 2. Detroit: With the addition of stud freshman Ray McCallum, the Titans have a big-time scorer to go with the inside-outside tandem of guard Chase Simon and big man Eli Holman. 3. Cleveland State: All five starters return from last season, including all-conference guard Norris Cole. Jeremy Montgomery and Trevon Harmon are also double-figure scorers. 4. Valparaiso: Valpo will be carried by its inside-outside duo of guard Brandon Wood and forward Cory Johnson. Both players are all-conference-caliber talents. 5. Wright State: Last year’s second-place team brings back guards Vaughn Duggins and N’Gai Evans, as well as sixth man Troy Tabler. They need frontcourt help, though. 6. Milwaukee: The return of Tone Boyle from injury will be the key for this team. JC transfer Keylon Williams and forward Anthony Hill could have breakout seasons. 7. Loyola-Chicago: All five starters return for the Ramblers, but this is a team that struggled last year. Terrance Hill and Walt Gibler are the two double-figure scorers. 8. Green Bay: The Phoenix are led by all-conference candidates Rahmon Fletcher and Bryquis Perine, who both can really fill it up from the perimeter. 9. Illinois-Chicago: New head coach Howard Moore is a big-time recruiter, but he will need to rebuild this team. He does have a solid backcourt in Rebo Kreps and Zavion Neely. 10. Youngstown State: The Penguins won just two games in the league last season, and they lose four starters. The lone returning starter is 6-foot-7 guard Vytas Sulskis. "There won’t be much of a race in the conference this season, either."